Wallenius Wilhelmsen says it expects bunker costs to rise about 50% as a result of the "IMO 2020" global 0.50% sulfur cap for marine fuel. The shipowner said the new rules, which come into force on January 1, 2020, represent "a challenge and risk for the shipping industry" not just in terms of cost, but also because of a lack of clarity around the availability and quality of fuels. 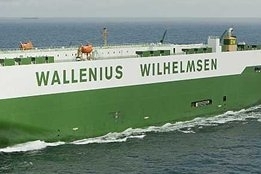 "Wallenius Wilhelmsen is relatively well covered through Sulphur (BAF) clauses already in place for majority of the larger customer contracts and aims to introduce relevant clauses for remaining customer contracts," the company said in a risk update as part of its latest quarterly report. "To handle this uncertainty, Wallenius Wilhelmsen has chosen a balanced approach which gives the best chance of managing risks and costs." That balance includes burning different types of low sulfur fuel, as well as fitting 20 of its "most suitable" vessels with scrubbers that will allow them to continue burning otherwise noncompliant HSFO. The cost for each retrofit was estimated at $6-7 million, and will take place "over the next few years" inline with their scheduled dry docking. Once complete, it will bring the number of vessels in Wallenius Wilhelmsen's fleet with scrubbers to 25.